Just Julie B's Stampin' Space: Put a Lid on it! 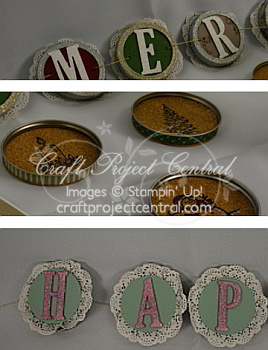 Craft projects using Mason jars are so trendy and fun. But sometimes your craft table gets littered with lids and jar rings that you didn’t need for projects. In this tutorial, you’ll learn two ways to use those lids and rings for adorable home décor and gift items. The jar ring banner is perfect for Christmas, New Year, or even a birthday or other celebration. And the jar lid coasters can be a fun, useful, yet inexpensive gift for friends on your gift list. These projects would be a nice stamp camp if offered together, or two separate classes. This creative project was made by Buffy Cooper and you can get her tutorial when you subscribe to the month of November over at Craft Project Central.